Digital Yacht has developed a new AIS receiver appropriately named AISnet which has been designed specifically for use as an AIS shore-side base station. 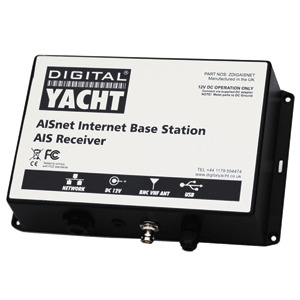 AISnet utilises the same well proved digital, dual channel receiver utilised across the whole Digital Yacht AIS range. With AIS transmissions on two VHF frequencies, the use of a dual channel receiver greatly improves target acquisition capability. It requires connection to a VHF antenna and an internet connection through a router or broadband modem. It also has a USB output for a local PC and is supplied with AISLite software so targets can be viewed. There are now a large number of internet based web sites which offer a view of AIS equipped vessels on a background chart allowing users to check the position and identity of ships and yachts. AISnet is designed to provide a feed for these sites. Some of these sites make a charge to users to view data and often provide free access to those who support the service with a receiver feed. Once installed, the user utilises the configuration software supplied to set up the AISnet receiver for the relevant AIS tracking website and AIS data received by the unit will be seamlessly relayed across the internet. If a local marina installs an AISnet receiver, boat owners can remotely monitor their vessel?s location so long as it?s equipped with an AIS transponder. Other applications include fleet monitoring, port operations control, passenger ship and ferry time tabling and updates, race control, fishing competitions Once installed, the user utilises the configuration software supplied to set up the AISnet receiver for the relevant AIS tracking website and AIS data received by the unit will be seamlessly relayed across the internet.